You've found the “U.S. Maran Chicken Breeders” page here at Hobby Farm Wisdom! If this is the first time you have visited our site: Welcome! The Maran chickens are a breed originating in France and imported to the United Kingdom in the 1930s. Maran’s were created using local feral chickens that has descended from fighting game chickens brought from Indonesia and India. Today, they are known as a dual purpose breed, producing a fine meat as well as extremely dark brown eggs. According to the French Standard, there are nine accepted varieties including Cuckoo, Golden Cuckoo, Black, Birchen, Black Copper, Wheaton, Black-tailed Buff, White and Columbian. 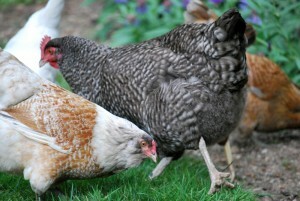 Maran chickens have a docile temperament but can be quite active. They are best suited for free range situations and do well in rough terrain. Hens will lay 150-200 eggs per year and the variety will determine the specific egg color. However the most popular are the extremely dark, chocolate-colored eggs.